I love homemade tortillas and make them so often for all kind of dishes like soft tacos, burritos, quesadillas or enchiladas. Last year I came up with an amazingly simple recipe which is one of the most popular recipes on my blog. It has been remade by so many people who found my recipe via Instagram, Pinterest, and Google. 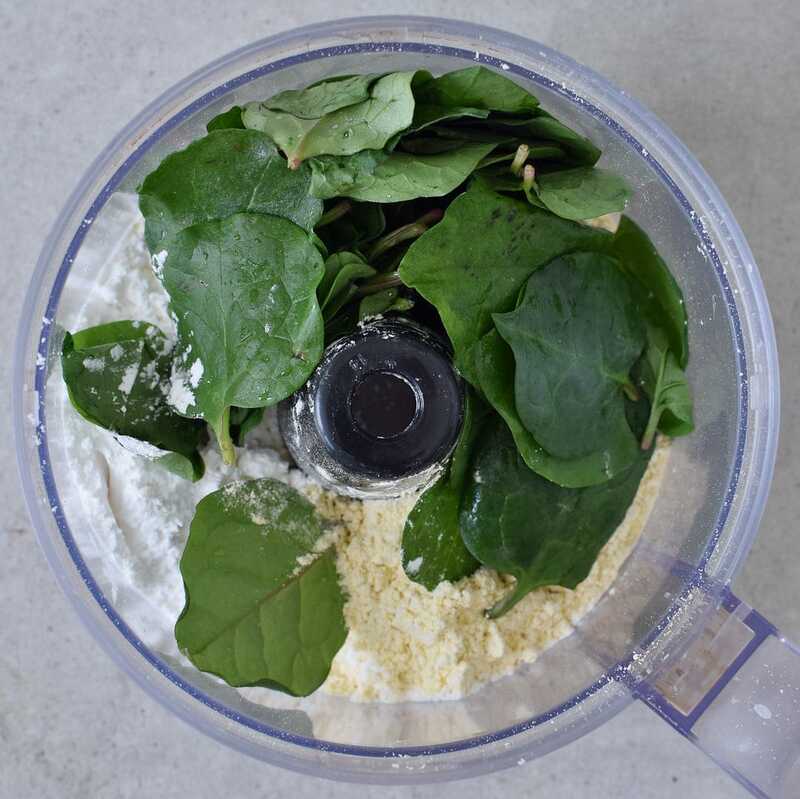 To make it even healthier, I added a good amount of spinach which not only adds a lovely green color but also many minerals, vitamins, and antioxidants. 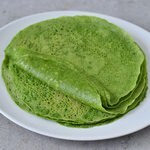 Are you curious to try out my homemade spinach tortillas? 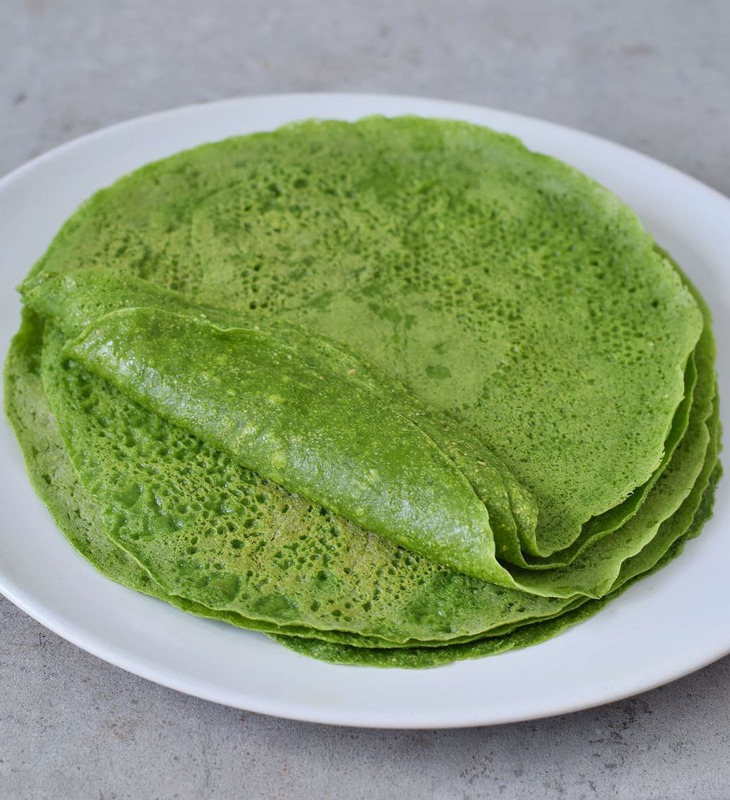 I use chickpea flour and tapioca flour to make these healthy spinach tortillas. This flour combination is absolutely amazing and the tortillas always turn out great. They never stick to my pan, they never burst, they can be rolled and folded beautifully and they are allergy-friendly (wheat-free, corn-free). They are furthermore protein-rich (because of the chickpea flour) and grain-free. We all know how healthy spinach is. It contains vitamins, minerals, antioxidants, and phytonutrients. Kids normally don’t like greens (I mean I get it, I didn’t like greens too when I was a kid). Adding spinach to these tortillas is pretty much tasteless! 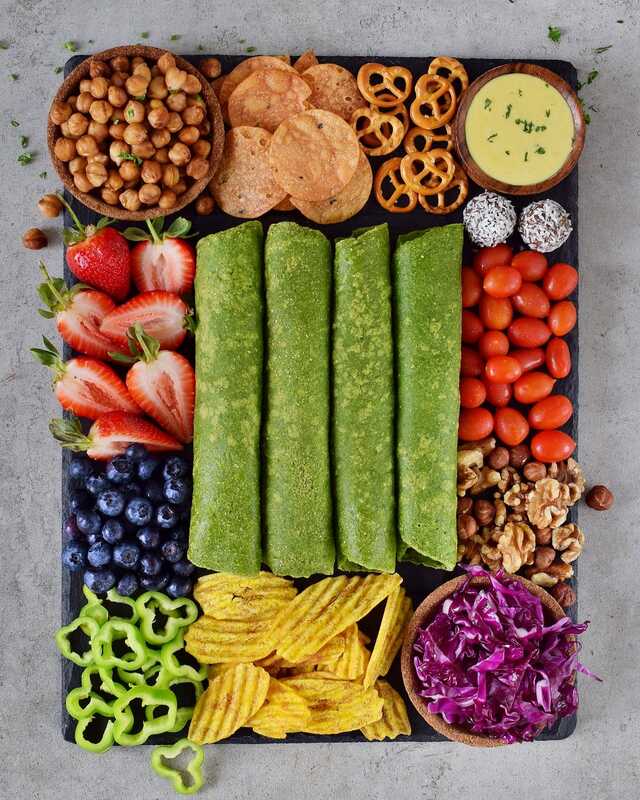 Especially if you fill the wraps with other ingredients like veggies, rice, vegan cheese etc. I seriously don’t taste the spinach at all. And if you should taste it, then simply use less spinach next time when you make these spinach tortillas. With time you can add more spinach and this will help to incorporate more greens into your own diet and your kid’s diet. It takes only 5 minutes to prepare the batter, as you just have to mix chickpea flour (also called garbanzo bean flour) with tapioca flour/starch, fresh spinach, water, and salt to taste. I simply put all ingredients in my food processor or blender and mix until the batter is smooth. Then pour some of the batter in a skillet and cook each tortilla for 2-3 minutes. The batter never sticks to my pan (I use a non-stick skillet) and I have made this recipe at least 100 times (not kidding). 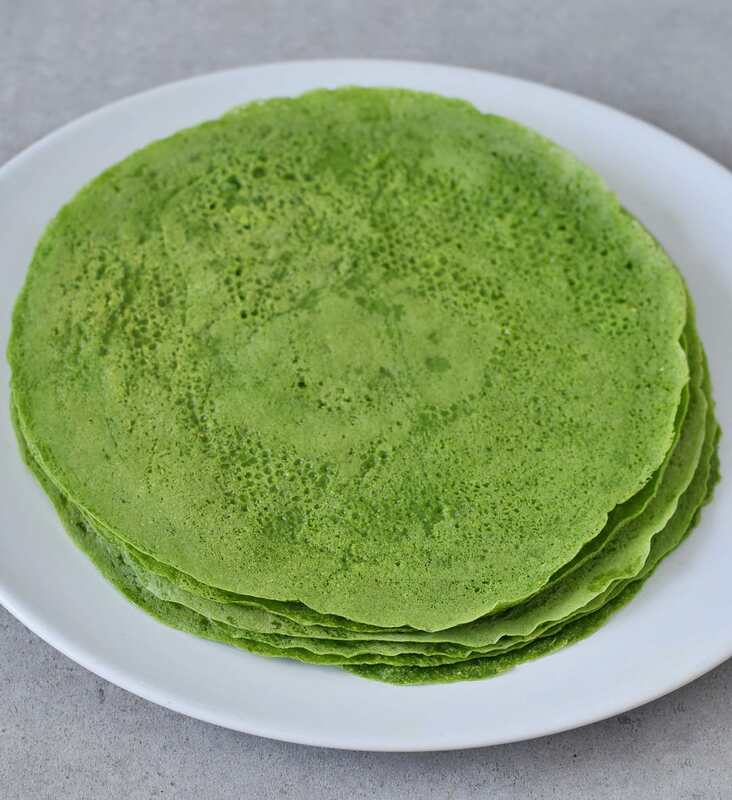 If you recreate my gluten-free spinach tortillas, please leave a comment below and don’t forget to tag me in your Instagram or Facebook post with @elavegan and #elavegan because I love to see your recreations. The recipe makes about 6-7 tortillas (1/3 cup of batter each). Wow Ela! They look so amazing!!! ???? Love especially this vibrant green color! Spinach is really one of my favorite greens. This is such a great recipe. Will definitely try it! Thanks so much, Bianca. I hope you will give them a try! ???? Thanks so much 🙂 I am glad you liked my recipe! This looks really grat, I’m going to try it this weekend, just wondring if I can change the tapioca flour to potato starch and also if I can store it in fridge later on or it will stick one to another? Hi Olga, you can give it a try with potato starch, however, arrowroot flour would be a better substitute. I always eat the whole batch that I make and don’t store them in the fridge as I guess they would dry out. But if you store them in freezer bags it might work. Arrowroot starch seemed to make it glutinous, stretch and undercooked in consistency. Haven’t tried the tapioca though. 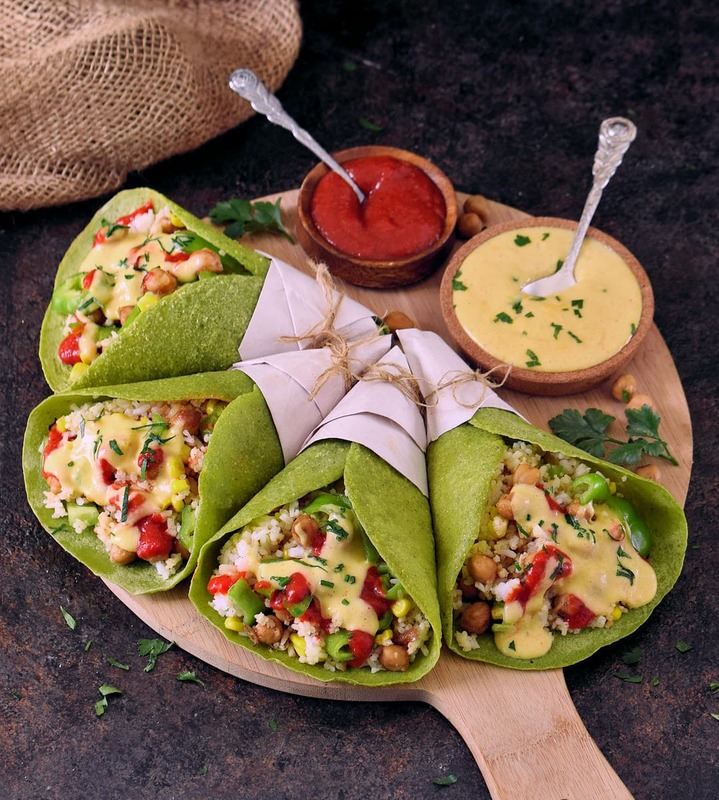 What is the yellow sauce in the picture with the chickpea & rice wraps? Also, will you post the recipe for it? Thanks so much! What a great recipe!! Can I substitute the flour with coconut flour? If so how much would it take! Thanks for all the great recipes! I was looking for gluten free tortillas all over the placer but they were too expensive so when i found your recipe It literally saved my life!!! The spinach give them a delicious veggie taste! Stunning Ela! That colour! They look amazing! And sound super easy! ???? Thank you very much, Jodi! ???? What can i substitute the tapioca flour with? Corn starch? Any suggestions? Is arrowroot the same as arrowroot flour? Because a half cup of arrowroot would a lot as it’s ised to thicken sauces and comes in a seasoning size bottle. I want to make it just don’t have tapioca starch/flour. Yes, arrowroot starch and flour is the same and is a good substitute for tapioca flour. This comes in bags. Look in the natural food section. How long can you put them in the fridge for? Can they be frozen? Hi Amy, I never tried to freeze them and only once had them in the fridge for up to 2 days. They get a little bit dry and need to be reheated. This looks amazing! Is it possible to replace the chickpea flour with another type of GF flour with the same kind of reults? I’m not vegan but a vegan friend sent this recipe to me and decided to give it a try. I am so in love with this tortillas!! I added a bit of cilantro to the recipe and they were delicious!! Thank you so much for providing such a great and easy recipe. I made your. 2 ingred. Tortilla and it was awesome, so can’t wait to make these. My question is can I freeze them and if so, what’s the best way to do so? It works! Just need to be sure to completely cool first and gently rewarm I Pam or microwave. I also just made them into little waffles. They took a bit longer to cook and had to flip over and cook a minute but they will be great under an egg ???? I’d send a pic but field doesn’t let me. I used a mini waffle maker by Dash. Thank you for your response. In the end I made it the way it was, which was much thinner than pancake batter, but still worked wonderfully! 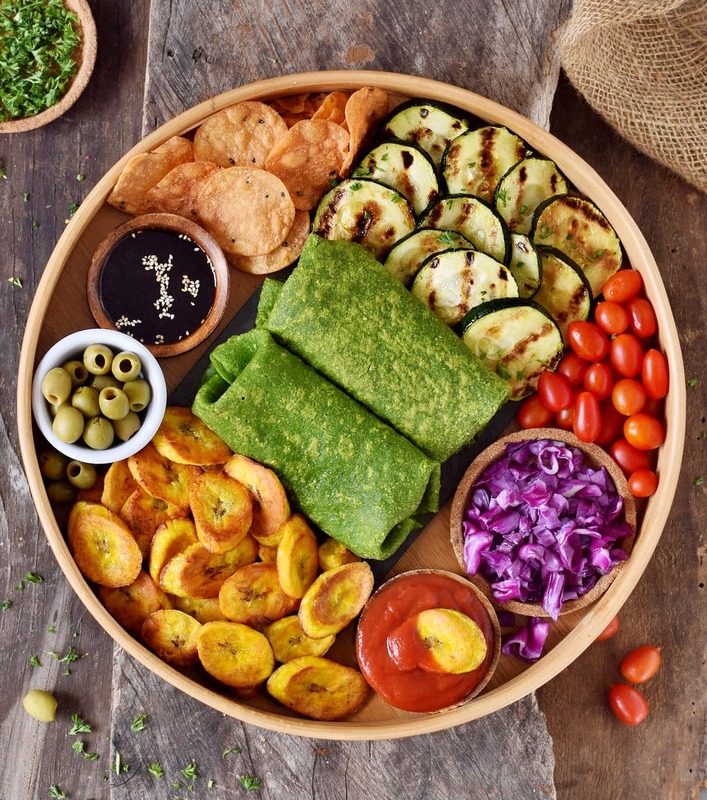 IT was the best Gluten Free wraps I’ve made yet! This one’s a keeper. Thank you for the wonderful recipe. After recently being told my husband needed to go GF, Dairy Free, and egg free I found this recipe. Made it yesterday and they turned out beautifully. Thank you for sharing your recipe. Hi. I made the tortillas, but mine came out a little on the thick side. I followed the recipe. What did I do wrong? I made your spinach tortillas yesterday for the first time. And I absolutely LOVE them! These look yummy & I am happy they have very few ingredients, I am sensitive to Garbanzo Beans so would I be able to use just 1 cup of Tapioca flour for the whole recipe ? Thank you. Hello Lauren! No, the recipe won’t work with just tapioca flour. Maybe you could use lentil flour instead. I haven’t tried it out yet but it should work as well. Another possibility might be buckwheat flour. Hope this helps. as another alternative as well besides the Garbonzo Bean flour? Thank you. Hello Ela, can you please tel me what is inside the rolled up tortilla. The picture with the 2 sauces. Question 2: can i make the tortillas the day before? Thank you in advance from Caroline..
Hi Caroline, the filling was cooked rice, pan-fried chickpeas, corn, chopped tomatoes, peppers, and my vegan cheese sauce. thank you so much also for your quick answer Ela! Can you please tell me the exact pan you have? I have an ikea one, but they broke down, even with oit. Hey, I am actually using a “no brand name” pan which I bought in a local supermarket. Any new non-stick pan does work beautifully though. Once the pan gets old (after a few months) it can get a little bit difficult. So you have to buy a new pan every few months?? Wow, these tortillas are amazing!,,, I’m eating them right off the skillet….small and thick or large and thin for burrito. I’m amazed at the uses for tapioca flour and garbanzo flour. And Thankyou so much for the recipe. I’ve made the tortillas today, they were amazing! !I’ve been looking for a gf tortilla recipe which doesn’t fall apart when I want to roll it for so long! Hey! Can I use almond flour in substitute for the flours mentioned above? Hi Ann, no that won’t work. Almond flour has a completely different texture and the result simply won’t be the same. Man, no matter what kind of pan (nonstick, all-clad, cast iron) and with or without oil, I could NOT get this recipe to work. Followed the recipe to a T, but the tortillas just would NOT hold together no matter what I tried. Anyone else have this trouble, and find a solution? I made the recipe countless times and so many of my Instagram followers tag me in their remakes on a regular basis. I wish I could help, but I really don’t know what causes the issues for you. Thanks! I actually came to delete the comment, because I did finally get it to work : ) Just had to play around with the batter a little, and use an oiled cast iron, and it worked like a charm! I came across your account on IG recently and was eyeing these since then. I made them today and wowza! They are awesome! Especially the “loading capacity” 🙂 I filled them with hummus, fresh and steamed veggies topped with hot sauce before wrapping them. Absolutely a staple. Looking forward to trying other recipes starting with stuffed potato cakes. These were wonderful! Thank you for the recipe, curious on how long they last. I stored them as I would my tortillas but they gor stick and began to smell after a day or two. How do you recommend they be kept best? So glad you liked them! I normally eat them right away but when I make a bigger batch I put them in ziplock bags and store them in the freezer. Can almond flour replace the chickpea flour? I am excited to give your Spinach tortillas a try. However – I’m wondering if you have more details/a recipe for the filling I see pictured that looks like rice, veggies, chickpeas, sauce, etc. ? I am not a “throw it together” type of person in the kitchen – I’d LOVE a more detailed recipe for an exact thing to stuff into the spinach tortillas. Like I said, the rice veggie sauce combo thing pictured looks great! I hope you can help me out, thanks so much! Hey Ela, I’m just wondering if I can replace both the flours with regular flour? I’m not gluten free. I can’t wait to make them! Chickpea flour is important in this recipe. You can try buckwheat flour but the result will be different. Can you make these with almond flour ? I am pretty sure that it, unfortunately, won’t work with almond flour. Hi! I made these the other day but they turned out extremely sticky to touch. Is that normal? Hm, mine never turn out sticky but they aren’t dry either. Did you maybe use too much spinach, water or tapioca starch? 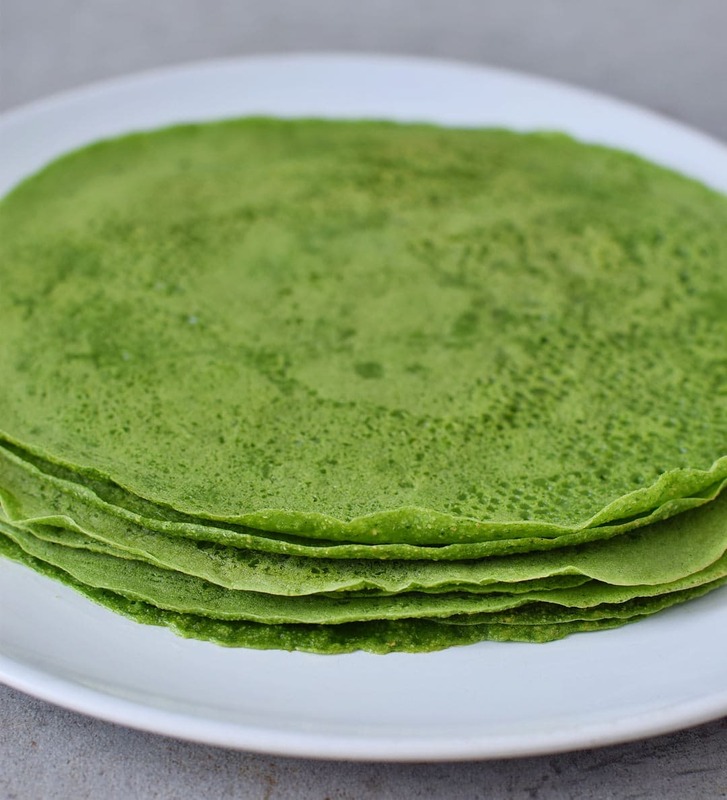 Honestly, the best flour-less spinach tortilla ever. I have tried tons of recipes and these are perfect. Tasty, easy to flip, do not break, light, perfect for tacos, or wraps, or canelones (as I used them with ricotta cheese and tomato sauce.. amazing), thank you for sharing the recipe and !!! Seriously amazing ! So simple yet impressive ! Thanks for an amazing recipe – you are very talented !